Classic Film and TV Café: A Cruel World, A Crueler Man in "Kiss Me Deadly"
Kiss Me Deadly was based on a novel of the same name by Mickey Spillane, featuring his immensely popular character. Reportedly, screenwriter A.I. Bezzerides, who adapted the book, had such aversion for the source text that the film ultimately took a dim view to Mike Hammer, turning him into a rather vile and despicable character. When initially interrogated, Mike refuses to talk, and the cops seem disgusted by him, asking him questions and patronizing him by "answering" on his behalf. When the gumshoe leaves, one of the men vindictively states, "Open a window." This is a man who knocks someone down a long flight of steps and smirks as he watches him roll down, a vicious person who clearly takes pleasure in slamming an uncooperative man's fingers in a desk drawer. He's the definitive antihero. He drowns the world out with loud classical music and screens his phone calls. 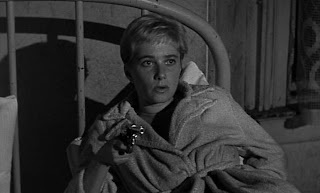 Kiss Me Deadly is a solid entry in the film noir genre. Mike Hammer in Mickey Spillane's novels was a driven man, taken to seeking his own brand of justice; just look at some of the titles -- I, the Jury, Vengeance is Mine, etc. But Aldrich's cinematic Hammer is much more brutally simplistic. He just wants the payoff, indifferent to the people he hurts or kills, ignoring the police's requests for information, etc. In the end, it's impossible to tell if Mike wants to solve the mystery, if he's still hoping for monetary compensation, or if he's merely going through the motions. Such an enigmatic and unlikeable character within a baffling plot makes Kiss Me Deadly a beautifully complex and highly recommended feature. Sark, I wonder how Mickey Spillane felt about having his character changed by a screenwriter into a selfish, sadistic man? I wonder why a screenwriter who so intensely disliked the source material was hired in the first place? I'm an avid reader, but I have never read Mickey Spillane. Your review has intrigued me about this character, and I want to both read the book and see the movie. As I recall from seeing him in other movies, Ralph Meeker's delivery seems just right for a surly, man's man out for vengeance and who enjoys violence. I'm really glad you did not give anything away, because this is one I have to see. As always, you've done a good job with this review. Sark, this is an outstanding, perceptive analysis of one of my favorite cult films. I love your interpretation of the title, which gives it a whole new--and more likely--meaning. Likewise, I love your your analogy between Cloris Leachman's running feet and Hammer's challenges in maintaining the momentum of his investigation. Ralph Meeker was never one of my favorite actors and, indeed, his Mike Hammer isn't the character created by Spillane (Stacy Keach probably came closer in his TV series). But Meeker's "nuclear age" antihero is a terrific creation, a man who seeks truth in a direct line, shoving aside whatever stands in his way. 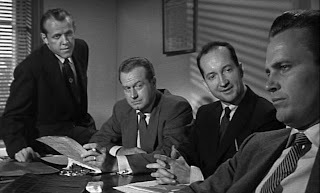 I wonder what Hitch thought of the "great whatsit", which, for most of the film's running time, is a classic MacGuffin. I agree that the opening (the running feet, the silhouette in front of the car) and the shocking closing scene leave an indelible impression. You've inspired me to pull out my copy of KISS ME DEADLY and watch it again. Becky, screenwriter Bezzerides claims to have encountered Spillane once (in a restaurant, I think), stating that it was fairly clear that the novelist was unhappy with him. That's the risk you run with selling your book rights. Filmmakers can alter the story/character how they see fit. That's why some novelists (or playwrights, etc.) have their names taken off films! Rick, the "great whatsit" was definitely a MacGuffin! I probably should've written up there that whatsit was changed from book to film. Some say it was to reflect the times, others say it was due to the Hays Code. It was likely both reasons. Sark, I really enjoyed reading this review. You make some nice points about how difficult the main character made it for the audience to root for him. The ending is a bit of a shock, but it goes well with the rest of the film. Sark, you can see how much of this film was (how should I say it in a family blog)"borrowed " in Pulp Fiction. Thank you, Kim. I think it's an appropriate ending, too. Paul, are you suggesting that Tarantino stole from another film? That's crazy! Sark, Yeah Right, That's crazy. BTW I was friends with the owners on the video store (Video Archives) in So Ca that he worked at in the 80's He was a" little punk" even back then. Sark, "Kiss Me Deadly" is decidedly a film that leaves an indelible impression on its viewer. Ralph is anything but a meeker Hammer. And I cannot imagine a less forgettable entry onto celluloid than Cloris Leachman's. Her frightening appearance sets a frenetic pace and a vivid sense of uneasiness. Exceptional review of a classic film noir. Loved it! Great selection Sark. 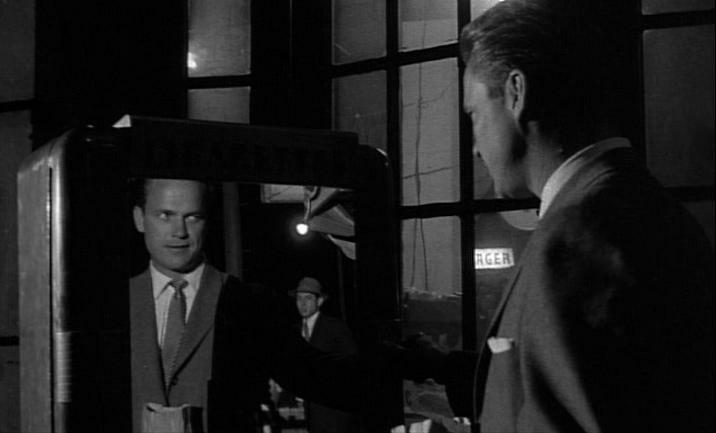 Kiss Me Deadly is a favorite of mine and I love Ralph Meeker's Mike Hammer. Great over-the-top noir. Sark, I saw this movie for the first time a couple of months ago. 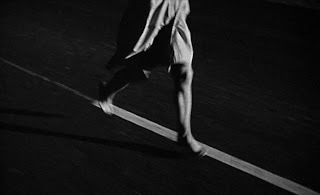 Kiss Me Deadly, is a great film noir to watch because of its "timeless" appeal. Right from the opening scene, you know you're in for a great movie. It is one of the finest of the "film noir" because of the moody black and white photography and its mind-boggling final scene. Sark, this is an outstanding review on this film. I haven't seen Kiss Me Deadly in many years. You are so right about Hammer not be portrayed as he was in Spillane's sixth book. I have read and own all 13 of the Mike Hammer books. My father bought me them for me. Kiss Me Deadly is my third favorite book. You make the movie look much more interesting than I remember it so I will have to watch it again. Nicely written and highly entertaining review. A beautifully done film noir, until the ending turns it into science fiction. Yes, the ending is definitely weird, but that bit of surrealism has contributed to its cult film reputation.